Keep your race day simple! Attend the Pre-Race Expo so you can pick up your race packet, including your race bib, timing chip and race shirt. Still considering for 2019 Trail Run. If you would like your business to host please direct inquiries to Danielle Perkio. Race packets may be picked up prior to the event at the Pre-Race Expo *or at the lake the morning of the event itself. *Packet pickup and registration are available on site, but not encouraged. Kids Race Warm-up: 9:15 a.m. The challenging and unique courses will take you out on the Lake Poway Trail through the foothills around the lake near Blue Sky Ecological Reserve. The 5K is designed to let you pick your pace. Enjoy it as an elite trail runner, as a challenging family run or simply a gorgeous morning nature hike. 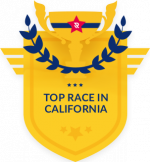 The 10K adds to this course — with a grueling out-and-back trek (or up-and-down if we’re being honest) into Blue Sky and a quad-burning +10% climb to the Ramona Dam. Take our advice and start training now! The Kathy Crafts Young Memorial Kids Race kicks off with a warm-up 15 minutes before the race starts and is perfect for kids 10 and under who aren’t ready to tackle the 5K and the mini-runners who want the fun without the competition! The approximately 1/3-mile course follows a trail on the near-side of Lake Poway and finishes in the same spot as the 10K and 5K — so even the kids enjoy all the fun and festivity of the main finish line. Parents are invited to chaperone their children in this race. The 10K and 5K will feature the IPICO timing system. The 10K will have waves start. The 5K will also have waves start. Your disposable timing chip will be issued to you at the Pre-Race Expo or on race day at the registration tents. You must wear the chip during the event to be scored. Pricing is based on each participant’s age, regardless of which race he or she chooses to run. Fees are non-refundable. We offer a special 50% discount for 5K and 10K adult entrants who are active-duty firefighters, law enforcement or military. Email Danielle Perkio for more information. Register now, no discounts will be honored onsite at the expo or on race day. Runners receive food and drink at the finish line to help them replenish and re-energize!